A man who admitted selling illegally imported puppies has been given a 200-hour community order. Attila Kovacs pleaded guilty to selling dogs illegally imported from Europe. 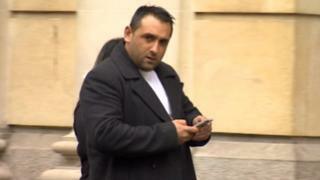 Kovacs' home was raided by trading standards officers and several dogs were found that had to be quarantined, at a cost of £26,000 to the taxpayer, Bristol Crown Court heard. The animals were sold on without the correct paperwork or vaccinations, the court was told. However, Recorder Ignatius Hughes said he had taken full account of Kovacs' mitigation, which was not read to the court, and found him to have been "reckless rather than dishonest". He warned Kovacs, of Westfield Park, Bristol, that if he did not comply with the community order he could be brought back to court. A fourth fraud-related charge was allowed to lie on file. Speaking after the sentencing, The Dogs Trust said underage puppies are regularly smuggled into the UK by dealers from Eastern Europe. The charity's veterinary director Paula Boyden said "dealers often disguise themselves online as loving family homes in order to dupe their buyers". A couple who bought a puppy from Kovacs three months ago told the BBC how the pet became seriously ill with parvovirus within 48 hours. "We bought him in good faith and Mr Kovacs was very convincing [but] as it turned out the puppy was extremely sick," they said. "It's been a long drawn out process and it has cost £5,000 to try and get him well. "We're gobsmacked how he has been able to get away with his behaviour."